Have you ever noticed how often Kronwall lines himself up to lay a big hit? Have you ever wondered how he does it? Setting up a big hit takes more skill than many folks realize; it takes skating ability, timing, size, and strength. But in Kronwall’s case, there’s even more to it than that. Believe it or not, Detroit’s systems are actually playing a huge role in setting up these “Kronwallian” hits, as we call them. 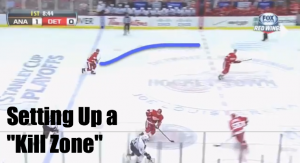 In the video above, you’ll notice that Detroit often runs a 1-2-2 forecheck. The way they set it up creates what I call a “kill zone.” I talked a bit about the Kill Zone in my NZ Trap Clarification post. Basically, the first forward in pressures, then the second two forwards angle back in a way that funnels the puck carrier to the boards. They create a “channel” that looks like open ice, but really, they’re just angling him into the area where they know Kronwall will be stepping up to make that big hit. Since both forwards are already funneling back, it’s 100% safe for Kronwall to make that pinch. Even if he misses, you’ve got the second defenseman, and two forwards already back. In these examples though, usually what happens is the forwards funnel back, Kronwall makes the hit, the puck squirts through, then the back checking forwards pick it up, initiate the regroup, and quickly re-enter the offensive zone.